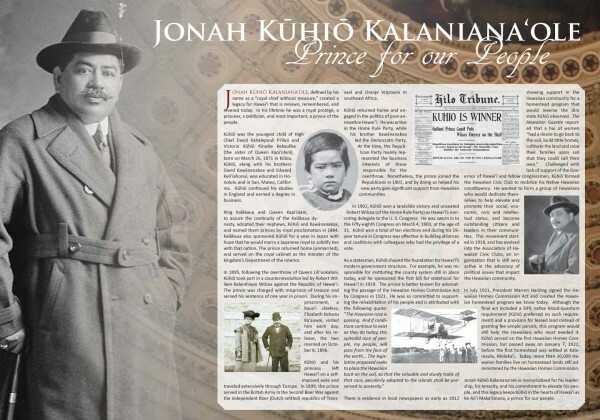 Click to download a PDF of this display board on Prince Kūhiō. Prince Jonah Kūhiō Kalaniana‘ole spearheaded the passage of the Hawaiian Homes Commission Act. In response to the dwindling native Hawaiian population, Prince Kūhiō convinced Congress to create a rehabilitation program for Hawaiians. In 1921, with the enactment of the Hawaiian Homes Commission Act, the United States set aside approximately 200,000 acres of land to establish a permanent homeland for native Hawaiians, who were a landless and “dying” people. The following excerpt is from the Congressional Record for Sunday, January 7, 1923. At the House of Representatives, the Speaker pro tempore, the Hon. William A. Rodenberg, a Representative from the State from Illinois, ordered that the day’s session be set apart for addresses on the life, character and public services of the Hon. J. Kuhio Kalanianaole, the late Delegate from the Territory of Hawaii who passed away on the same date of the previous year. 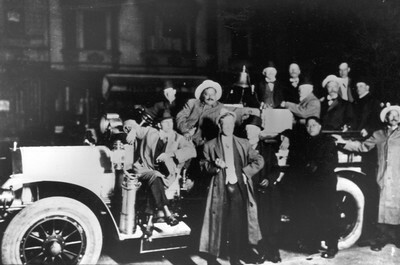 Prince Kuhio with friends in a fancy motor car. He was born on the island of Kauai, Hawaiian Islands, on March 26, 1871. His father, Kahalepouli, was a high chief and the son of the last King of Kauai; his mother was Princess Kinoiki Kekaulike, sister of Queen Kapiolani, consort of King Kalakaua. His boyhood was very different from that usual to an American. As a member of the royal family he was brought up in the court of his uncle, the King, and took part in all official functions and receptions at the palace. At the age of 13 he was created a prince by royal proclamation. His early education was in Honolulu at the Royal School and Punahou College. He then spent four years at St. Mathews College of California. Later he was a student at the Royal Agricultural College in England, winding up his education in a business college there. At the conclusion of his college days he spent a year as the guest of the Japanese Government, his uncle, King Kalakaua, hoping that he would marry a princess of the royal house of Japan. 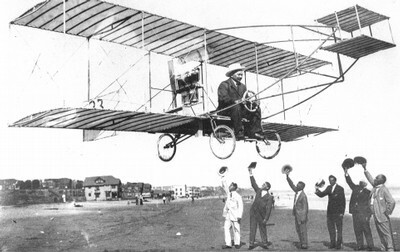 Prince Kuhio flies an early airplane. Although he grew up to early manhood as one of the royal family, with the probability ever before him that he would some day be the King of the Hawaiian Islands, he was democratic by nature, taking part in all athletic sports and excelling in football and rowing. He was an expert horseman and there was nothing he enjoyed more keenly than going with the cowboys after wild cattle and horses on the rugged slopes of Mauna Kea, or spearing wild boars from the back of a horse. He was a polo player of no mean ability. He also was fond of yachting and game fishing – sports which he enjoyed almost to the day of his death. An excellent marksman with either rifle or shotgun, he was a welcome member of shooting parties. Golf was also a favorite pastime – in fact he was an all-around sportsman. After his return to Hawaii from Japan he took a position in the Department of the Interior of the Hawaiian Government in order to obtain practical experience. In this position he made a good record for industry and efficiency. Of royal lineage and a probable future king, his outlook on life and his prospects were brought to an abrupt change by the overthrow of the Hawaiian monarchy in 1893, when the Republic of Hawaii was established. Prince Jonah Kuhio and Princess Elizabeth Kahanu Kaauwai Kalanianaole on their silver wedding anniversary at Pualeilani, their home in Waikiki, 1921. The young prince was then 21 years of age. Two years later there was a revolution of the Hawaiians, with the object of reinstating the ex-Queen, and Prince Kuhio, true to his beliefs, took part in this revolution. For this he and other leaders were arrested as political prisoners and sentenced to a year’s imprisonment. While he was in prison he became engaged to a young chiefess whom many of you know as his gracious princess wife. They were married soon after his release and left shortly for a tour of the world, among other places visiting Africa, where he hunted big game. He was there during the Boer War and took part on the side of the British. He returned to his island home in the fall of 1901, and in 1902, after urgent persuasion, became the Republican candidate for delegate to Congress and was in that year elected for his first term. I was a member of the convention which nominated him and can bear witness to his great reluctance to enter the field, for he believed he could do more for his people at home than he could 5,000 miles away here in Washington. Characteristically, after having made up his mind as to his path of duty, he never swerved, and was elected to Congress for 10 consecutive terms notwithstanding that he continued at the head of his party’s ticket at great personal sacrifice. In all these elections he was loyally supported by the great majority of the white residents of Hawaii, as well as his own people. During the 19 years of his membership of this body, always uppermost in his mind was the welfare and prosperity of his constituency and especially that of his own people. I do not wish to convey the idea by this that he was not in every sense of the word an American, for he was, unqualifiedly. He lost no opportunity to preach the doctrines of Americanism to his people and to impress upon them their great good fortune in being citizens of the United States, the greatest country in the world. To illustrate his loyalty to the stars and stripes, I quote from a speech he made on the floor of this House June 23, 1917, when he spoke of the death of several Hawaiian boys drowned when the steamer Aztec was torpedoed by a German submarine. He said: “Two thousand and odd miles out in the Pacific are the islands that constitute the Territory of Hawaii. Our fame for a beautiful, wonderful country is world wide; but Hawaii is more than a playground, a retreat for tourists; it is the western frontier of our Republic. We Hawaiians guard the western doorway. While Hawaii stands, our coast line from Alaska down the long stretch to the Panama Canal Zone is safe from successful invasion or attack.” This shows the man – a loyal 100 percent American. 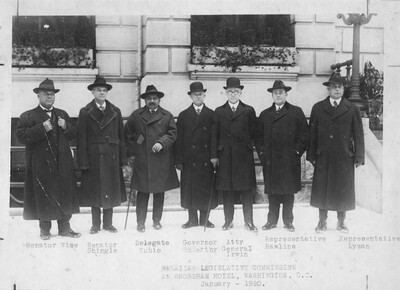 Congressional visit in 1915. 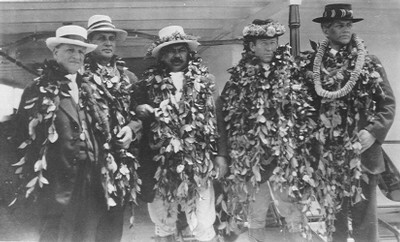 Pictured from left to right are Rep. Carter Glass; Speaker of the House Holstein; Delegate Prince Jonah Kuhio Kalanianaole; Rep. Phil Campbell of Kansas; and Mayor John C. Lane of Honolulu. John, I hope you boys will stick together and try to agree to the best of your ability to meet this most important problem – the rehabilitation of our race. Although it was known that Prince Cupid, as we loved to call him, was seriously ill, his death came a year ago to-day as a grievous shock to his host of friends in Hawaii. At Pualeilani through the night of vigil, while the Prince was sitting in his armchair, himself knowing that death could not long be barred from entrance to his chamber, he sat with his face toward the open door facing Kalakaua Avenue, his lessening vision drinking in deeply of the green verdure across the way in what was formerly the great acres of his aunt the Queen Dowager Kapiolani, in whose home he had spent so many happy days of his boyhood and young manhood. Sitting by his side was Princess Kalanianaole. She held his hand closely. The Prince smiled often as his eyes met those of his sweetheart Princess and he appeared to be hoping that her last view of him would be a memory of him still smiling. He was the last titular prince of his line and his funeral was the last royal funeral that will be held in Hawaii. He was buried with all the pomp and pageantry of ancient Hawaiian royalty in the royal mausoleum. Officials of our own and foreign Governments were present in their official capacities and throngs of friends of all nationalities came to pay the last tribute to the departed. The beautiful silver mounted koa casket was placed in a catafalque and drawn by 200 stalwart Hawaiians from the former palace to his last resting place, a distance of over a mile. In the funeral procession the Army was represented by a considerable section, departments of Government, organizations of various kinds, schools, and thousands of friends and admirers all marched in the procession. The services at the palace and at the mausoleum were indeed impressive and will dwell in the memory of those who witnessed it until death shall have claimed them also. Prince Kalanianaole was a prince indeed – a prince of good fellows and a man among men; a man of sterling sincerity and strong convictions – he always stood for what he deemed right – yielding to no weakness, and manly always. Congressional Record courtesy of the Library of Congress. Photos courtesy of the Hawaii State Archives and the Bishop Musem.